A pretty good day and a book review | Keeps Me Out Of Mischief! I had a lovely day yesterday; I didn’t think I was going to as I’d worried it was going to be a sad day, it was an anniversary of sorts. But I have wonderful friends, who were determined to make sure it was a good day. We didn’t really have anything planned, other than a coffee, a gossip and a wander around some shops, but it was one of those days where the sun shone and almost everything was good. We started off with coffee in Costa, so far, so unadventurous; my friend pleaded with them to make sure that they gave me decaffeinated coffee; she’s experienced me bouncing off the wall when I’ve had caffeine! You will find very few coffee based recipes on here in the future; my husband likes the smell but not the taste and I love both but hate the effect it has on my body and mind! We had a slice of chocolate tiffin each which made me start thinking about recipes – add it to the ‘to do’ list! We then decided on a wander around the shops. She lives in a small country town which has some beautiful shops and she knew exactly which ones to take me in! First the knitting shop – so many beautiful yarns and ideas for new projects. I didn’t buy anything; I forced myself not to! I already have two knitting projects on the go and I didn’t think I would be very popular if I took any more wool home! I can always sneak ideas into the house – they don’t take up any space! 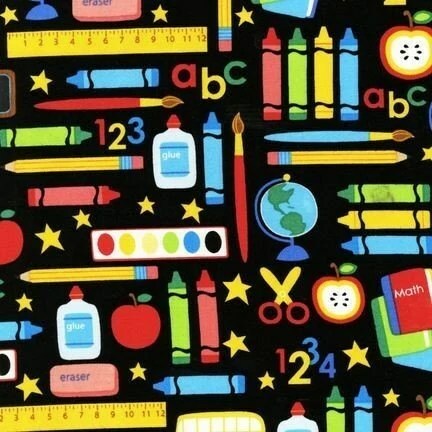 Next stop was the fabric shop, there was the cutest school supplies fabric, but at £14.99 a metre, I thought it was a bit too expensive when I didn’t really have a project in mind – I can, of course, think of about ten projects I can make with it now. I’ve just had a look on etsy and littlegiggles has it for less than £9 a yard, even including postage to the UK – fabric is so much cheaper in the US – it’s not fair! I don’t know if could be patient enough to wait for it to arrive from the States though. Then it was off to the bargain book shop. I love these shops, full of interesting discounted books; some have slight cosmetic damage to the covers, but they’re still the same inside. The beauty of these shops is that you never know what’s going to be there; they’re not predictable like some of the high street bookshops, so you have to go in with an open mind and plenty of time for a proper browse. The cookbook section wasn’t hugely inspiring so I moved onto the crafts. I found Make by Cath Kidston on offer for £7.99 rather than its cover price of £15 because it had slight damage to the cover. It’s set out in a scrapbook style and is full of lovely photography including close-up shots of the finished projects which have a theme of appliqué and embroidery. There’s a clear, step-by-step approach to each project and a useful section explaining how to do each of the techniques needed, it’s good that this isn’t repeated for each item. The book is broken down into various sections containing a number of projects including kitchen, bedroom, bags, clothing, kids and gifts. There’s also a ‘be inspired’ section at the back of the book which helps you to see everyday fabrics as a blank canvas for embellishment, together with all the templates ready for you to trace onto Wunderweb ready to iron onto your material of choice. For a beginner sewer there’s a useful list of items you might need in your work-box. The drawback of the book is that it focuses on ready-made base materials, e.g. the bags are all ready-made so that you can then add your design to them. A head start is given with this in that they include a canvas tote bag ready for you to add to so I know what I’m going to be doing this afternoon but for those who don’t have the ability to make their own bag/ apron/ tablecloth then it’s more of a book that provides ideas on embellishing pre-bought or pre-loved items. It’s probably a good book to give as a gift or for inspiration rather than a book to buy as part of your reference library. A bit of a bargain at £8 but I’m not sure I would’ve bought it for myself if it had been full price. My friend knows me well; gossip, knitting, sewing, food and books! We followed the shopping with lunch in a cafe and more coffee in the sunshine. I went home with happiness and project ideas – a pretty good day really! « I did something very British today! Sounds like a really good day. I just love to fabric shop, but the prices are keeping me from doing much buying these days.